No tent solutions that can be completed today! There is a great variety that exists when it comes to the control of Termite and other wood destroying organisms. The cost that these organisms cause to the property owners normally reaches into the thousands, for this reason it is a great idea to do a little research about how they work and what is the best solution available for your situation. Although different properties will have specific recommendations depending on the infestations discovered during the initial Termite Inspection, property owners are still the ones that decide which termite control method they use. With the known changes in the environment many customers are now looking out for Environmentally Friendly Termite Control Treatments and Solutions. There are many natural and organic termite control solutions that exists to take care of your wood destroying organism infestation without harming the environment, like it is the case with structural fumigations which release the toxins out on the ozone layer once the process is completed. 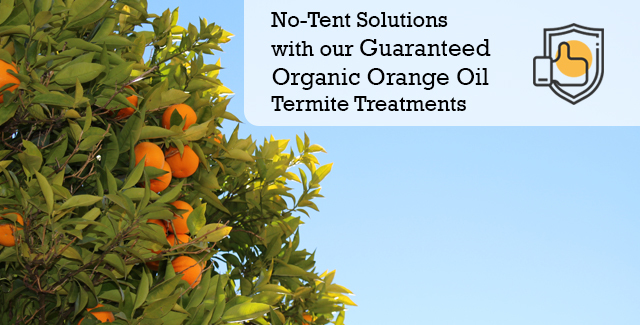 The most known and used natural termite control solution is Orange Oil Treatments. This organic solution is made out of D-Limonene, which is extracted from the rinds of mature oranges. D-Limonene can be found in many of the regular household products because of its non-toxic abilities. This organic solution for the control of Termites has been adapted by many companies and property owners not only because of its low impact in the environment but also because this is also a no-tent solution which means that the structure does not be to be vacant for any period of time. Regularly the only notable sign that a treatment has been completed is the oranges-like smell that typically stays around for 4 to 5 days after. In a study made at the University of Florida by professor Rudolf H. Scheffrahn, it was found that Orange Oil had up to a 97% mortality rate in lab experiments. A localized termite control treatment made with Orange Oil can take anywhere from 30 minutes to a couple of hours depending on the areas where infestations have been noted. During this time our trained Termite Control Exterminator will drill into the infected wood and inject the Orange Oil Treatment into the termite tunnels. By this we will make sure that all of the areas where termites can live in are treated to make the termite treatment successful. Because this is a nontoxic termite control solution you can have the peace of mind that your family and pets are protected and will not get any residual effects. If there is structural damage already caused by the termite colony, then it is recommended that the treatment is accompanied by the appropriate structural repairs so that the property can return back to its original condition. This are termicide that have been created in a laboratory for the specific intent of controlling different Termite infestations. Treatments with BASF Termidor are highly recommended as an alternative for spot or local treatments. This is a 3-day process, in which your entire structure will be treated guaranteeing 100% extermination for up to 2 years. It is normally done using a Liquid/Gas Fumigation with sulfuryl fluoride as it’s active ingredient. Our favorite fumigant and the one that we use for all of our properties is DowAgro Vikane. Click Here To Schedule A Free Termite Inspection Online today online or give us a call to (619) 421 – 2101 and we can assist you in setting one up. Let the operator know that you wish to use an Organic and Natural Termite Control Treatment option so that your inspector can make the appropriate recommendations. Remember, each situation is different, and a specific solution is usually recommended depending on the degree of the infestation. A treatment with Orange Oil it’s not always the best-case scenario, but your licensed inspector will provide you with the different scenarios and information so that you can make a more informed decision.